The oasis of Todos Santos is thriving with plants and animals. However, even outside of the cool ocean breezes and life sustaining mountain spring water there’s an abundance of flora and fauna. While on first impression areas of Baja California may strike some as a barren uninhabitable desert, there is actually a diverse and thriving ecosystem well worth a second look. There are approximately 125 plant species in Baja California that can not be found anywhere else in the world. Sierra de la Laguna, a mountain range easily accessible form Todos Santos, is home to both the only dry jungle and the only pine-oak forest in Baja. Some of the more common desert plants include Cirio (also known as the Boojum), Cardon, Century Plant, Ocotillo, Prickly Pear, Candelabra Cactus, Old Man Cactus, Barrel Cactus, Cholla Cactus, Creosote Bush, Datilillo, Elephant Tree, Organ Pipe Cactus, Palo Blanco and Palm tree. My favorite, is the Elephant Tree which reminds me of the Baobob of Africa. The most common Elephant Tree is the Torote, which is a protected plant in this region. In addition to the many insects and reptiles that live in the Baja desert, many of the mammals are the same that are found in the southern deserts of the United States. There are coyote, gray fox, raccoon and bobcat. However the chances of seeing one of these animals are very low as they are nocturnal. Some common large birds include the Brown Pelican, Frigate bird, Turkey Vulture, Roadrunner and the Caracara. Many North American water birds migrate to the Baja California coastlines during the winter months. Todos Santos’ tropical setting between ocean and desert creates the opportunity for bird-watchers to see an amazing variety of bird life in a relatively short time and small space. 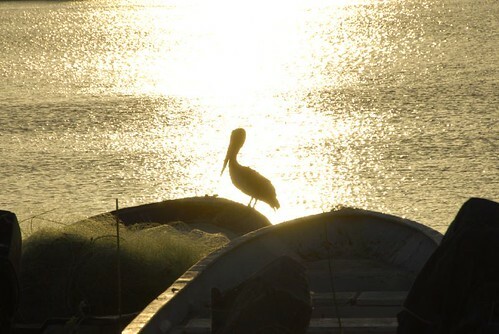 The lagoon near Posada la Poza and Las Palmas are two unique areas for bird watching. Also, the ‘Campo Experimental’, four miles South of Todos Santos on the Highway to Cabo, is a federally funded botanical garden with 1,000 hectares of varied vegetation which allows bird-watchers to explore most of its area. Its emphasis on regional flora and fauna and rehabilitation of the environment makes the area attractive to birds and productive for birders. Baja California is nearly surrounded by water and has two distinct shorelines. 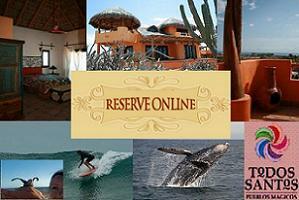 The shorelines follow the Pacific Ocean and the Sea of Cortez. With so much coastline, Baja has a wealth of marine mammals. You can find California Sea Lions, Elephant Seals, Finback Whales, Guadalupe Fur Seals, Humpback Whales, Harbor Seals, Bottle-Nosed Dolphins and the California Gray Whale (see Whale Watching). Colonies of Sea Lions reside on some of the beaches south of town.